The Bahamas recently celebrated a celebration of 30 years of partnership with UNESCO by having a week of meetings, luncheons and displays of UNESCO projects. 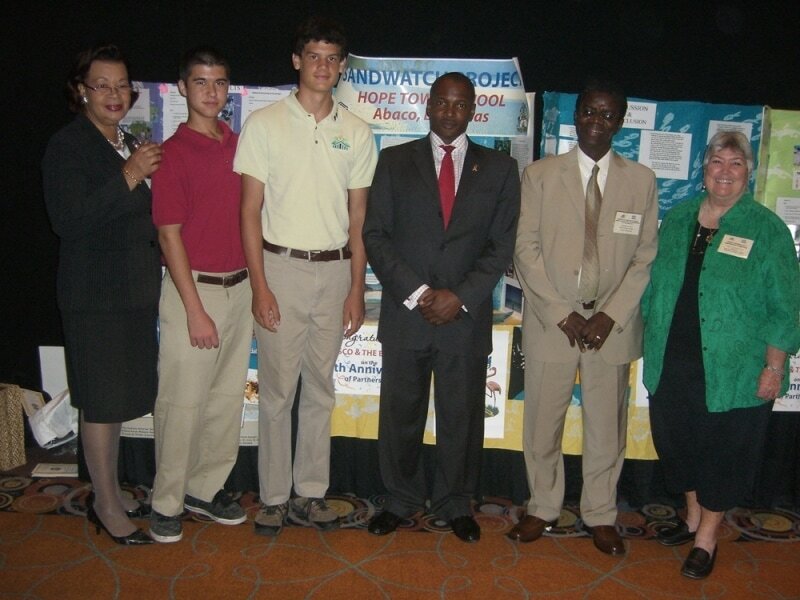 Hope Town School, longtime Sandwatch project participants, were invited to display highlights of their activities at the celebration held in the capital of Nassau. James Boyce and Lance Roberts attended with Hope Town School Principal, Mrs. Candace Key. James and Lance are now in High School but the projects they were involved in are still some of the most important ones done and they said it was just like they were still doing the projects as they explained them to guests and officials. The display was quite extensive and drew a lot of attention. Hope Town School has been nations top Sandwatch school for over 10 years. The Minister of Education who was the keynote speaker for the event proudly mentioned the Sandwatch project and had James, Lance and Mrs. Key stand up to loud applause. 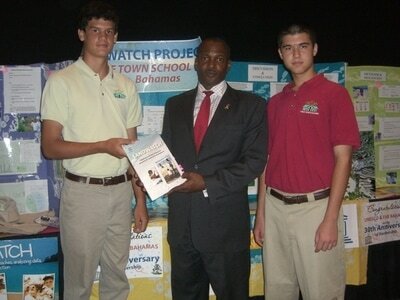 As the officials visited the display, the Education Minister was presented with the new Sandwatch manual by James and Lance which features several articles and pictures about the Sandwatch work James and Lance did at Hope Town School for many years. By Candace Key, Sandwatch Coordinator, The Bahamas. (L to R) Mrs. Elma Garraway -Permanent Secretary Ministry of Education, Lance Roberts- Sandwatch participant, Minister of Education- Honourable Desmond Bannister, Mr. Kwame Boafo - UNESCO Director and Representative for the Caribbean from Jamaica, James Boyce-Sandwatch participant, Mrs. Candace Key-Sandwatch Co-Coordinator for the Bahamas.